Oh, the power of Twitter. You jokingly put an idea out there and, the next thing you know, the joke becomes a reality. In my case, I suggested to Stella (@foodieyu and writer of Food Junkie Chronicles) that we go to Holy Chuck and try their epic “Go Chuck Yourself” burger. Two weeks later, we had dinner plans booked and there was no backing out. We reviewed Holy Chuck a while back and opined that they are one of the best burger restaurants in the city. 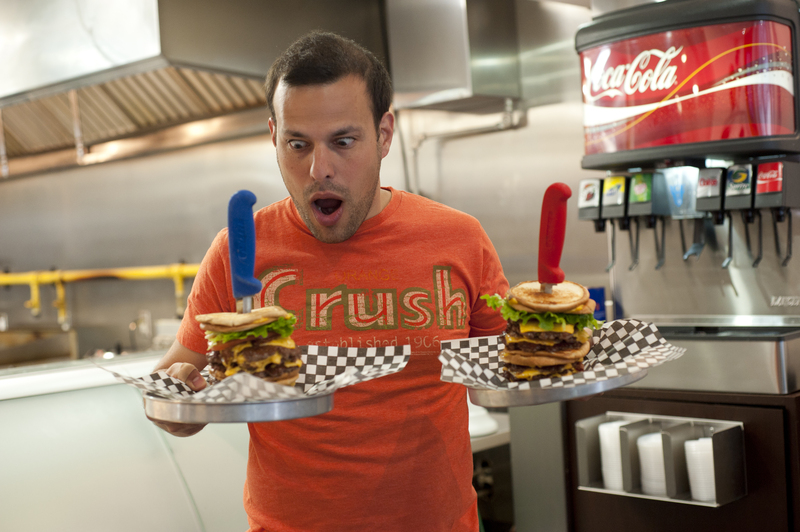 Today, we were going to tackle two of the crazier burgers they make. 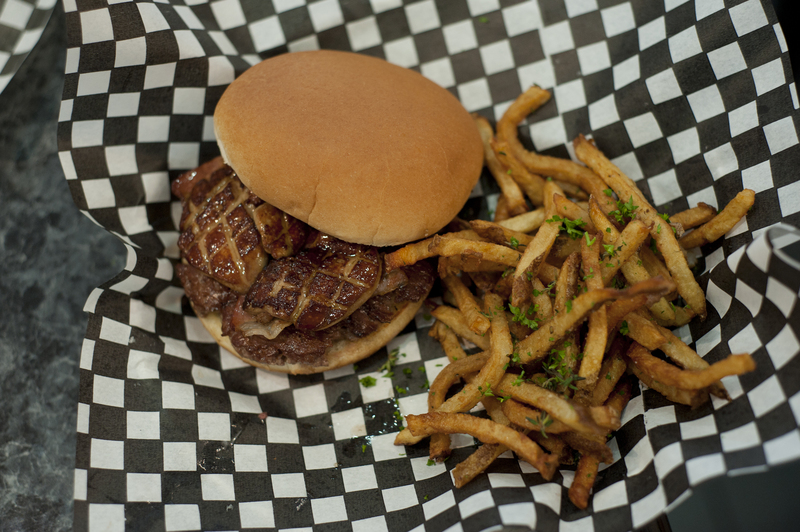 The Holy Duck burger is a single beef patty covered with double smoked bacon and a slab of fois gras, then drizzles with truffle oil and maple syrup. 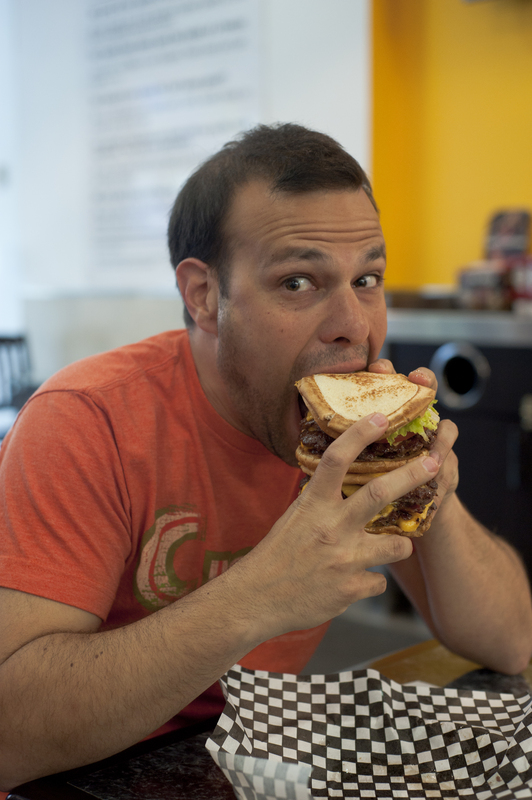 This is one serious umami blast! Robin will eat fois gras if given the opportunity, so this burger was hers. Combine the nice meaty flavour of Holy Chuck’s patties with the buttery goodness of fois gras, the smoky bacon flavour and the flavour kick from the truffle oil and maple syrup and you get one hell of a special burger. I rubbed some of the fries in the truffle oil that dripped from the burger. Wow. I present to you the show stopper: the Go Chuck Yourself burger. 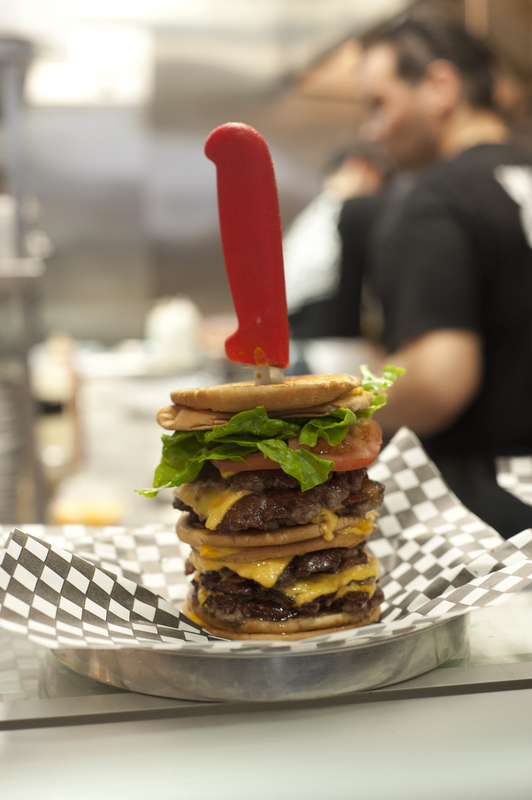 They pile up 6 burgers with 6 slices of cheese, toss on a bunch of bacon and caramelized onions and sandwich it with three grilled cheese sandwiches. Yeah, not for the faint or weak of heart. As I brought the burgers to the table, I thought “how will Stella be able to eat one of these?” Stella’s roughly half the size of me and the burger is approximately the size of her head. I wondered: what would Darwin say about what we were about to eat? I could barely hold it in my hands. If my parents ever read this blog, they’d probably disown me. With Robin’s help, I managed to handily eat the burger. Flavour-wise, the burger is excellent. The patties are juicy and full of flavour. I really didn’t have a problem eating such a ridiculous quantity of food. It was incredibly tasty from start to finish. 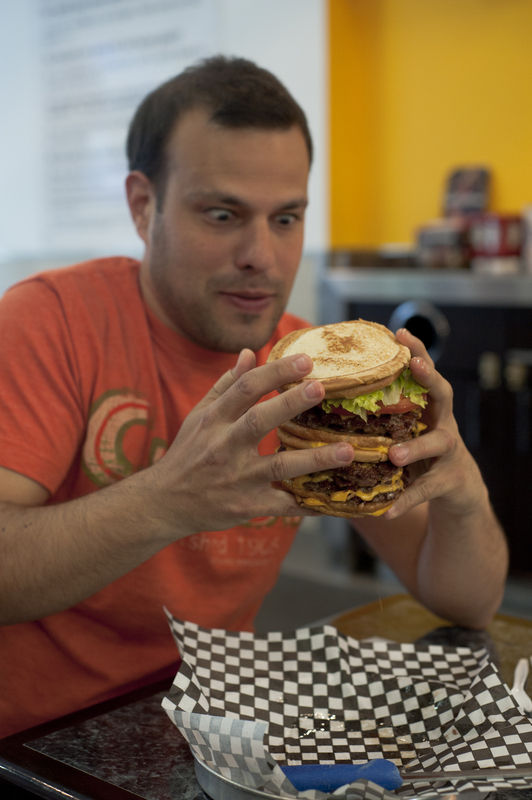 I find that most burgers are over-salted or overcooked – not at Holy Chuck. Even through this tangled mess of bacon and bun, I could still taste the ground steak that’s used to make the patties. I was drinking a Nutella and salted caramel milkshake (probably the best shake in Toronto) to help wash the food down. It goes without saying that, the following morning, I had to skip breakfast. I was actually really disappointed with Holy Chuck. I forget which burger I had, but it was quite expensive, small, and incredibly greasy. It was pleasantly not cooked into oblivion, as per Ontario standards, but I don’t think I’d go back for a burger. I do want to try a shake, though, those look cool. The shakes are the best I’ve ever had. The Nutella and salted caramel is our go-to shake, but I also really like the bacon, fudge and sea salt shake. The burgers: yes, they are greasy, but that’s the style. People love the grease. Its like eating a marbled steak that was griddled. That either sounds incredibly disgusting or incredibly delicious. Price: I understand exactly what you’re saying. To their defence, Holy Chuck’s making their burgers from nice cuts of meat. its not the pre-ground stuff that most restaurants use. You do get what you pay for (the quality of meat, them grinding it fresh in house) but yes, you do pay more than most other places. Oh my! I couldn’t imagine trying to eat that giant! 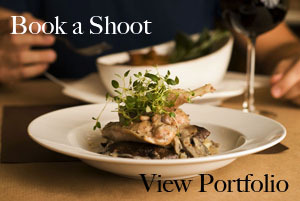 It does, however, look delicious!